We are pleased to announce Transportes Lalgy Lda as new members in Mozambique. The family owned company was established in 1990 and has offices in Matola, Beira, Tete, Chimoio, Nacala and Pemba. General Manager, Aly Ibrahimo Lalgy states; "We are amongst the biggest transporters in Mozambique, 100% Mozambican-owned with more than 25 years of experience and extensive knowledge of the market and country. We offer competitive rates and aim to establish long-standing relationships with our partners and customers. Transportes Lalgy offers a wide variety of transport options to meet various needs and respond to market requirements. We have an aggressive growth strategy and are continuously growing our fleet which currently stands at over 400 vehicles including over 50 abnormal trailers essential for the fast and efficient delivery of project cargo for the mining and oil & gas industries. Our experience in coal & mining, oil & gas, infrastructure, construction, power & energy as well as regional import and export operations have required heavy and large equipment to be moved to remote areas in the countryside where such projects are located. Where the road ends, we carry on!" "The reconstruction and new opportunities within Mozambique are creating a period of unprecedented growth. To support this there is a huge and urgent need for quality logistics service providers. The geography of the country, with the sea ports of Maputo, Beira, Nacala and Pemba, coupled with the extremely limited rail infrastructure, makes road transport the only viable option to support the growth and development within our country." 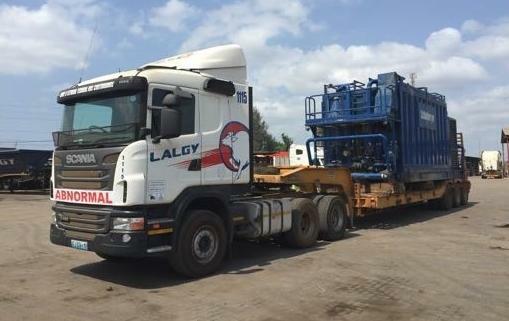 Some recent projects handled by Transportes Lalgy have included an 18m pipe transport, a drilling rig movement, mining stacker and reclaimer transport and heavy machinery shipments. Please click below to download a PDF detailing some abnormal and project cargo case studies from Transportes Lalgy as well as their company profile.